1. A basic legal framework for combating money laundering and terrorist financing is in place in the UAE, but that framework needs further strengthening in a number of areas. The AML law needs to be amended to expand the range of predicate offences and to provide greater powers for the financial intelligence unit. The FIU should also increase its own staffing so that it may operate as an autonomous unit, rather than relying on the resources of the Central Bank’s Supervision Department and other regulatory agencies. 2. The legal framework for the financial sector preventive measures in the domestic sector provides a basic grounding, but it mostly predates the revision of the FATF Recommendations in 2003, which have now imposed much more detailed requirements. While the central bank has taken various administrative measures to strengthen the regime within the domestic sector, these require a more solid basis in the legal and regulatory framework, especially with respect to the customer due diligence (CDD) and related obligations. 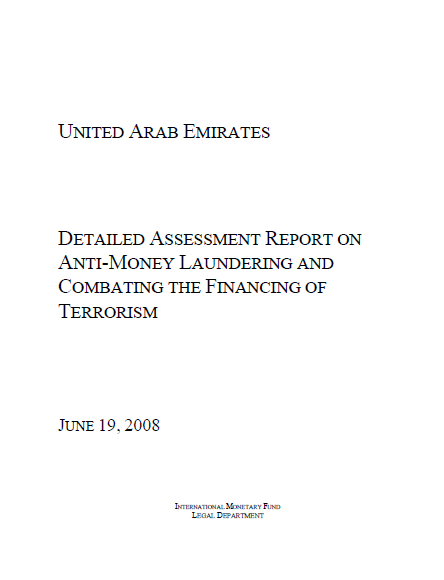 The regime applied to financial institutions operating within the Dubai International Financial Centre2 tends overall to be relatively close to the FATF standards. of being linked to either money laundering or terrorist financing. progressively to formalize its oversight regime for this sector, which is to be welcomed. various free zones vary substantially. needed in order to clarify the FIU powers and responsibilities. extent of AML/CFT awareness across all legal and law enforcement sectors needs to be addressed. enforcement, customs and the judiciary is also required. Authority (DFSA), for all financial services providers in the DIFC. coordinated approach to the development of future regulations. issued rules that generally match the FATF standards. the size and nature of the financial markets. to provide explicitly for rule-making powers with respect to terrorist financing. towards meeting the FATF standards, but those for the securities and insurance sectors fall well short. with the insurance sector not yet being subject to any effective AML/CFT compliance monitoring.